New American Theatre (formerly Circus Theatricals) have been plying their trade for more than thirty years. They have developed a reputation for fresh and insightful Shakespeare productions. This pared down and sped up Measure for Measure by the company’s founding director Jack Stehlin trains its focus on the hot-button issues of sexual harassment and the abuse of power. The minimal but classy design by Stuart Chapin seems to suggest Italy rather than Austria, but maybe that’s a better fit for the themes of corruption, lust, and religious hypocrisy. This is a big show (with cast of thirteen) for such a small space but the traffic of the stage is well handled; scenes flowing into one another with momentum, aided by effective but unobtrusive lighting design by Kathi O’Donohue. Leah Dalrymple as the wronged Isabella is wise and willowy, unwittingly beguiling both Angelo (Daniel Kaemon) and Vincentio (Patrick Vest). The pedal-to-the-metal pacing serves the story better than it serves the poetry, so some of the more soul-searching monologues for Isabella and Angelo seem a bit out-of-place in this treatment. Sub-plots are stripped to the bone, so the story can move quickly to its next twist. All the cast handle the dense language extremely well, particularly Vest, who takes us through the story with a conspiratorial charm. Other stand-outs for me were Bruno Oliver, as the pragmatic Pompey, and Brendan Brandt as the loquacious Lucio. The zeitgeist-y spin on the piece is interesting and definitely holds water, though it does undermine Vincentio’s integrity a little, he comes across as someone who is trying to do the right thing, but is ultimately not as woke as he should be. Putting everyone in modern dress makes it easy to forget that this piece was written more than four hundred years ago. The final quadruple-wedding announcement seems more-than-usually optimistic, I predict a 25% success rate. Production values are good in this newly refurbished venue that is now the company’s home. 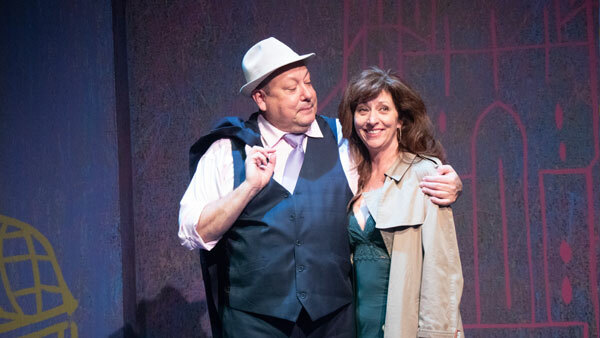 Photo (above) by Jeannine Wisnosky Stehlin: Leah Dalrymple and Daniel Kaemon in Measure for Measure at The New American Theatre.